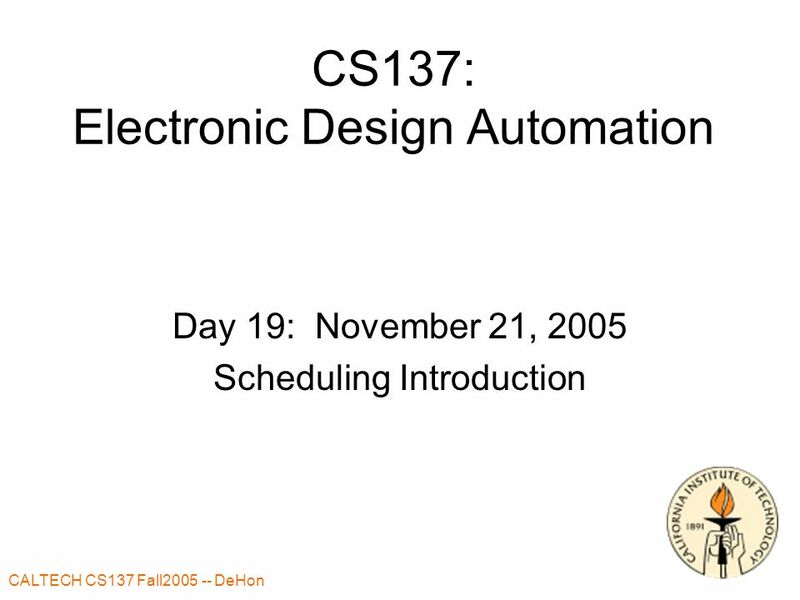 CALTECH CS137 Fall2005 -- DeHon 1 CS137: Electronic Design Automation Day 19: November 21, 2005 Scheduling Introduction. 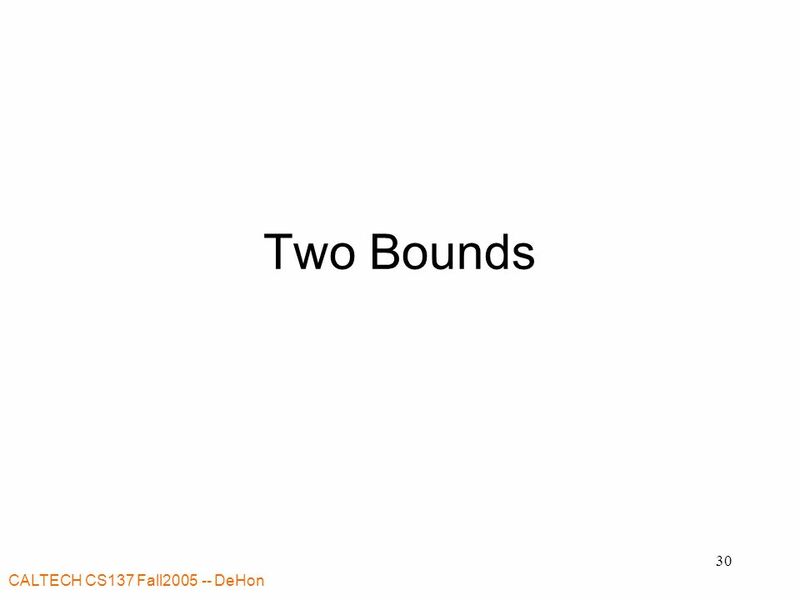 22 CALTECH CS137 Fall2005 -- DeHon 22 Why hard? 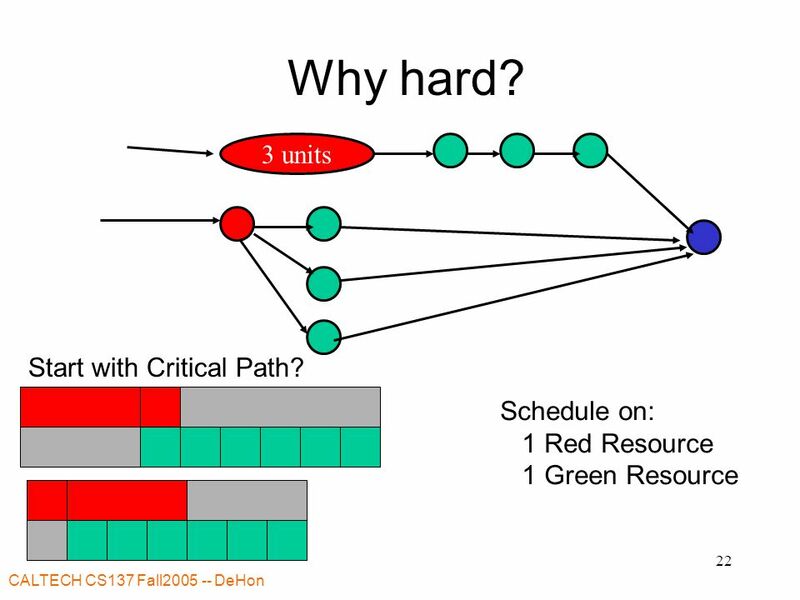 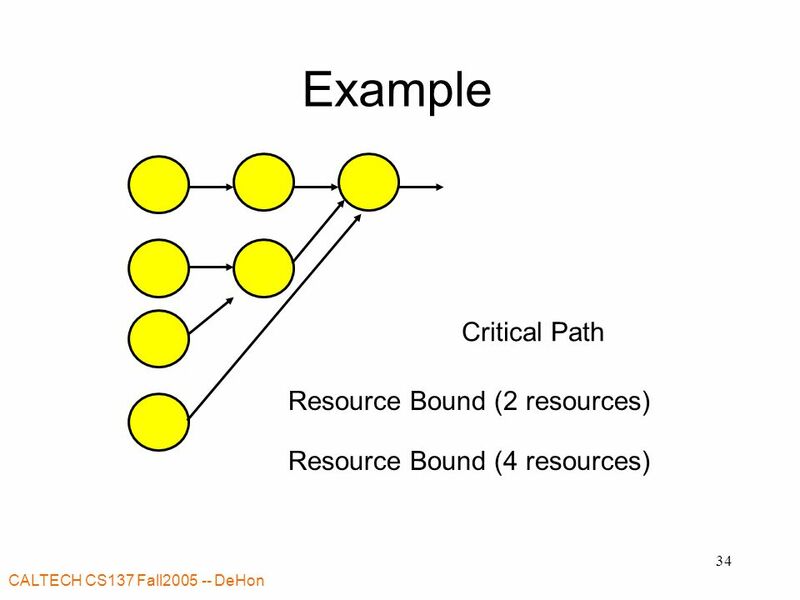 3 units Schedule on: 1 Red Resource 1 Green Resource Start with Critical Path? 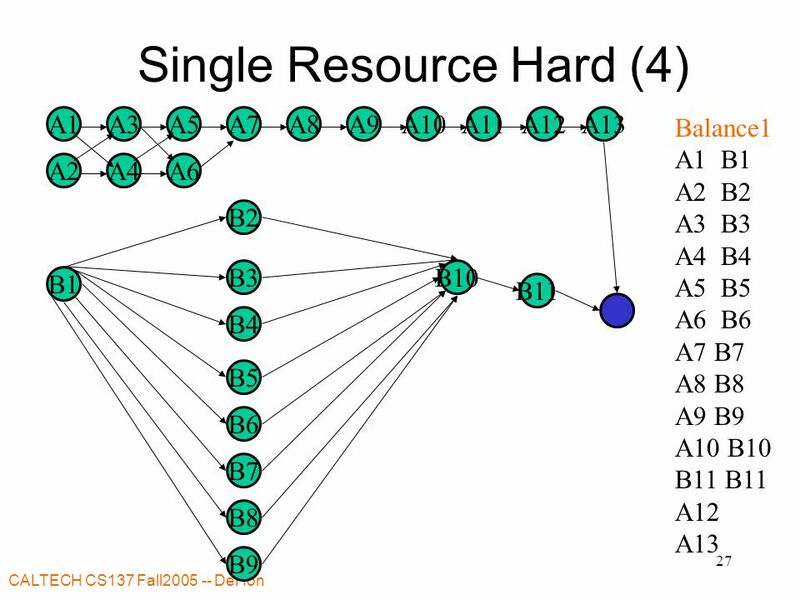 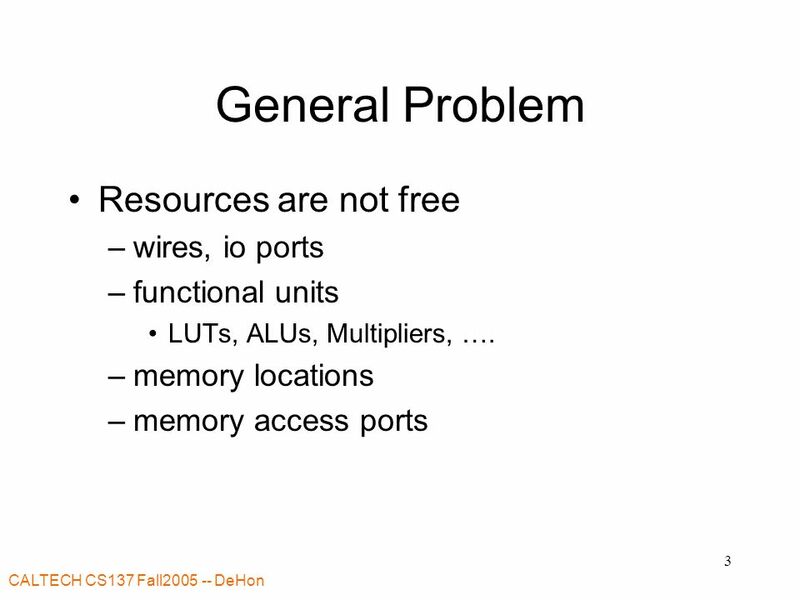 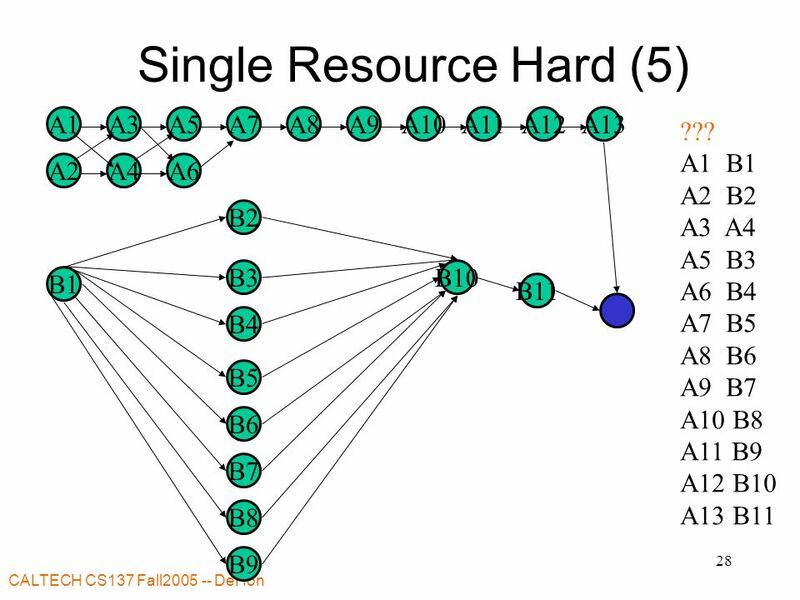 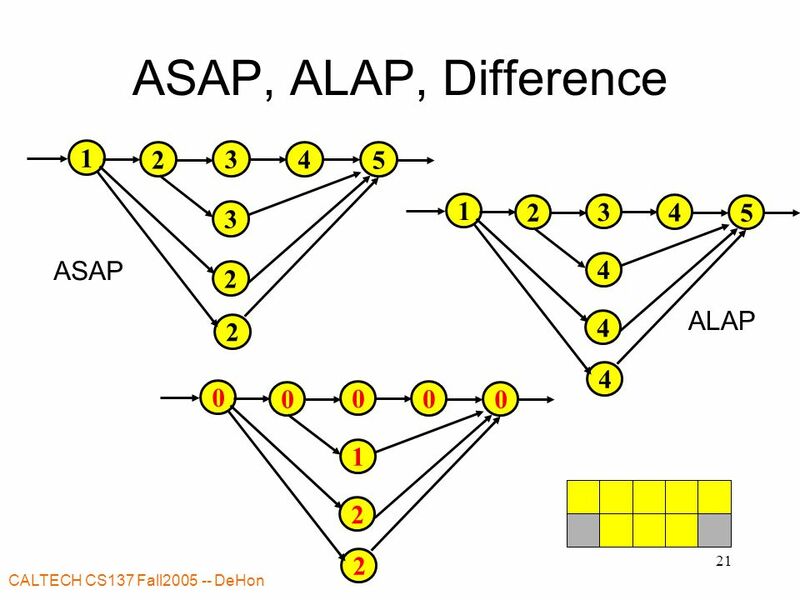 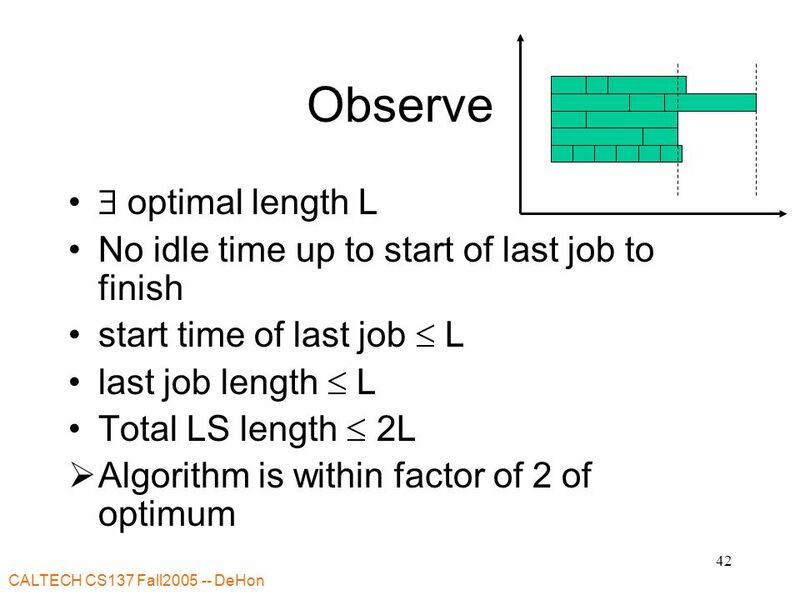 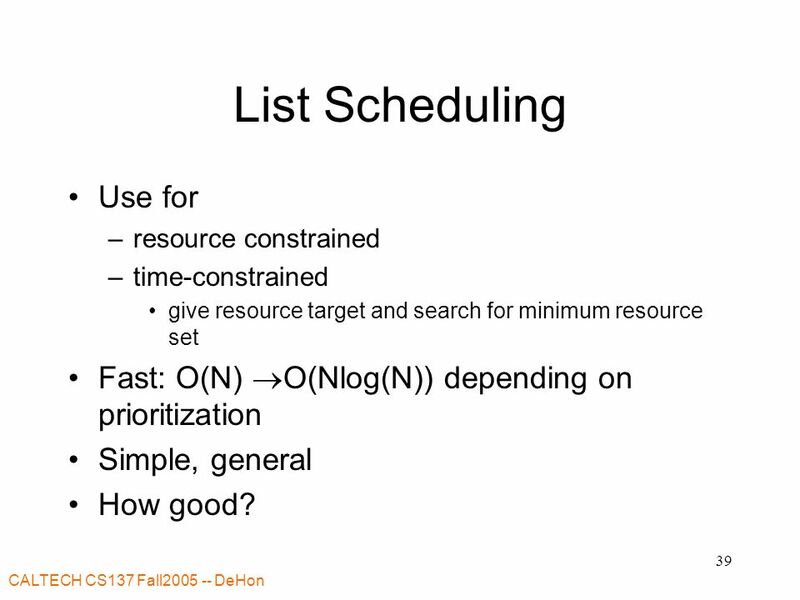 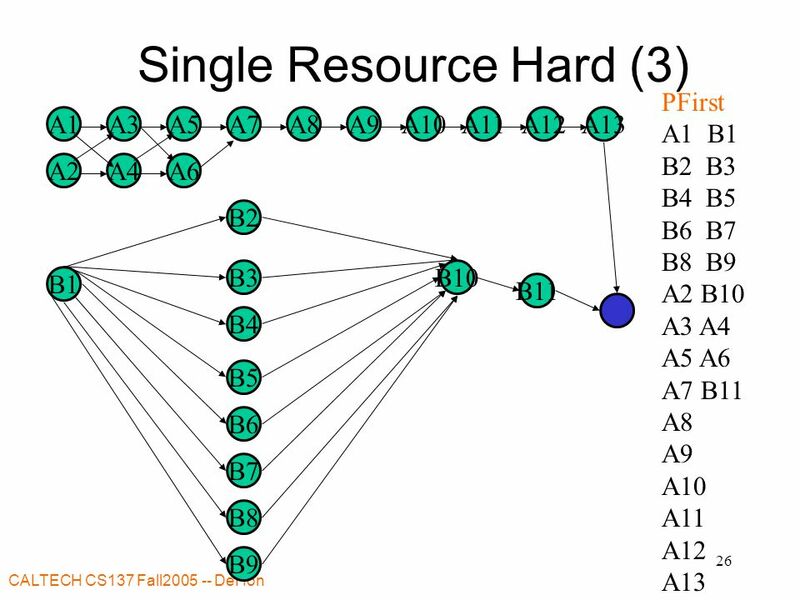 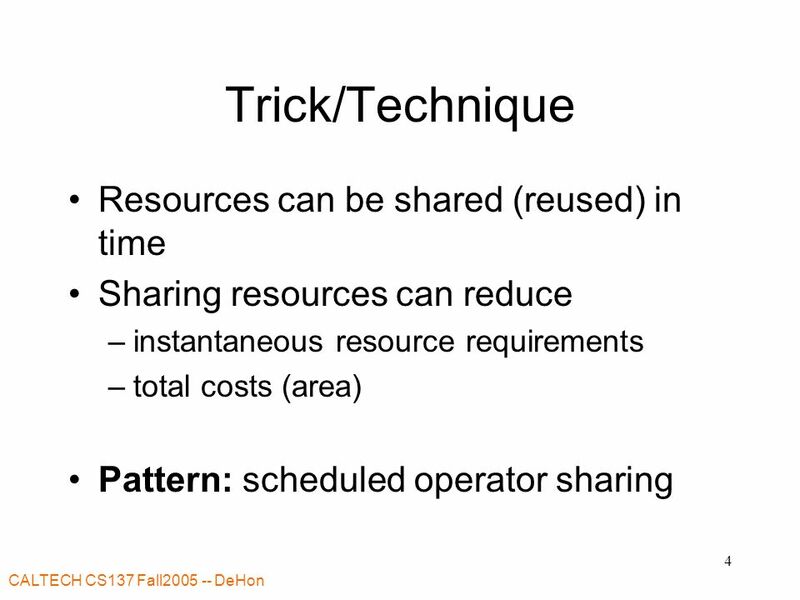 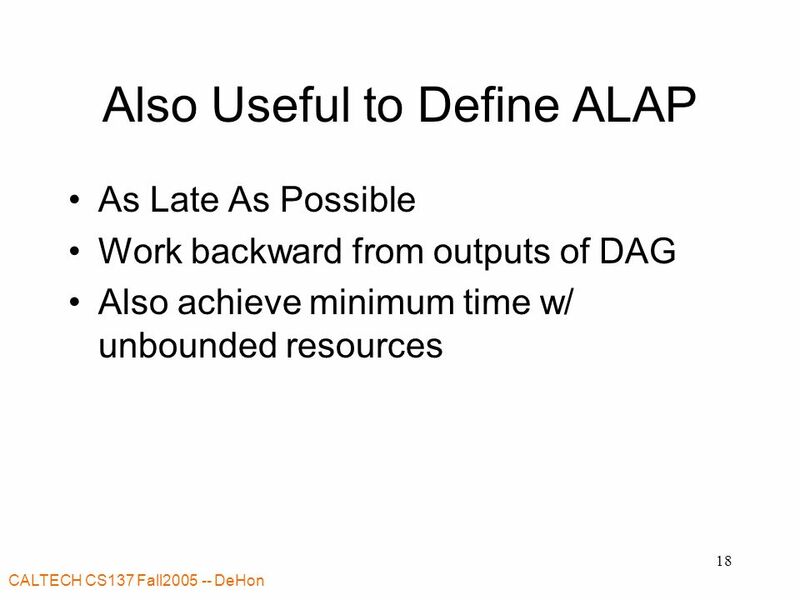 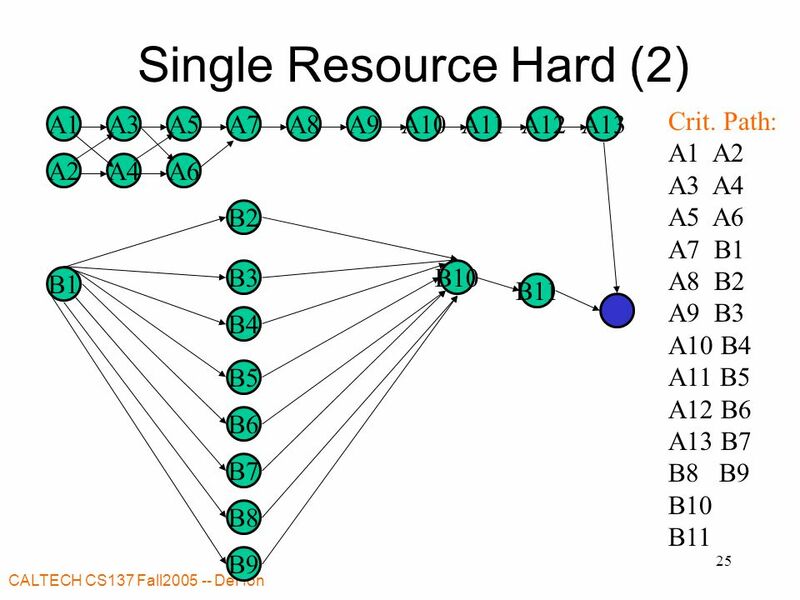 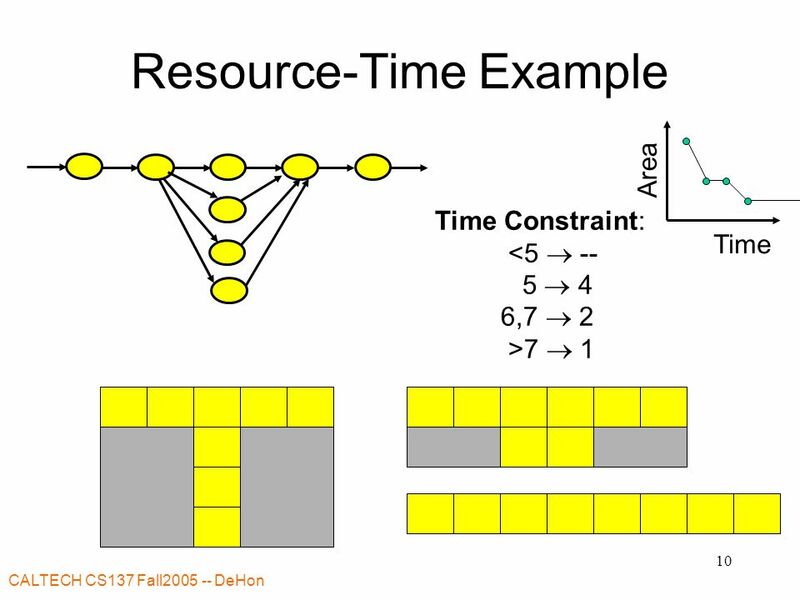 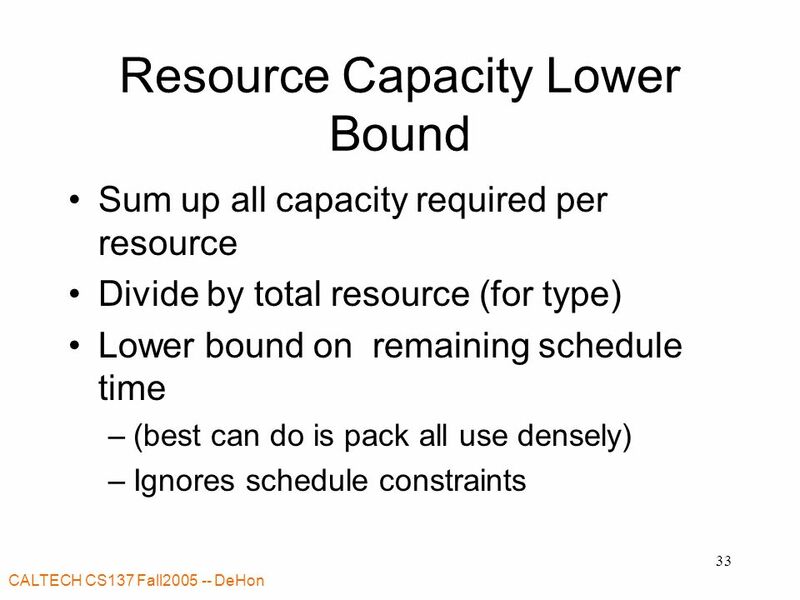 39 CALTECH CS137 Fall2005 -- DeHon 39 List Scheduling Use for –resource constrained –time-constrained give resource target and search for minimum resource set Fast: O(N)  O(Nlog(N)) depending on prioritization Simple, general How good? 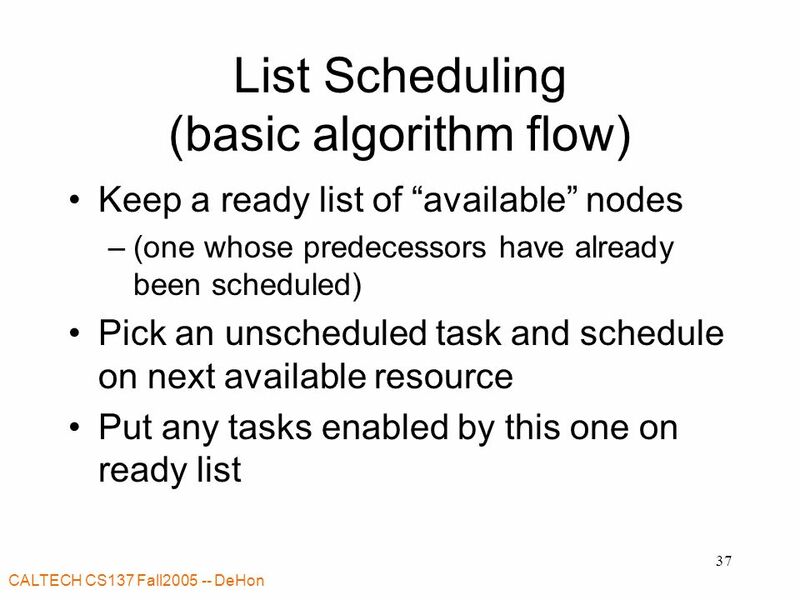 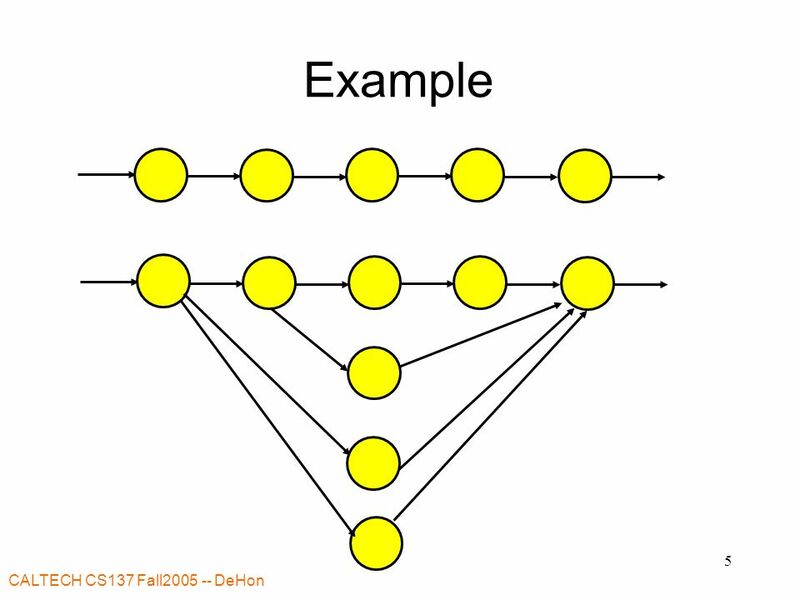 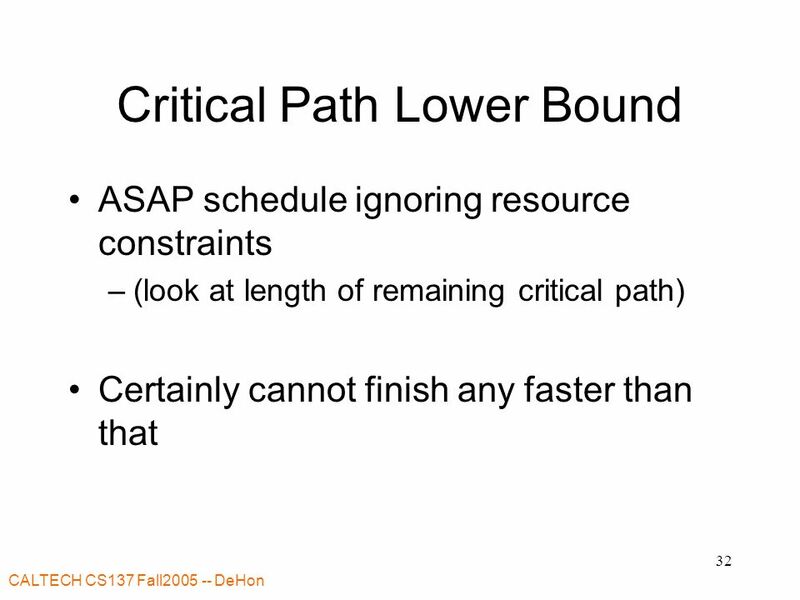 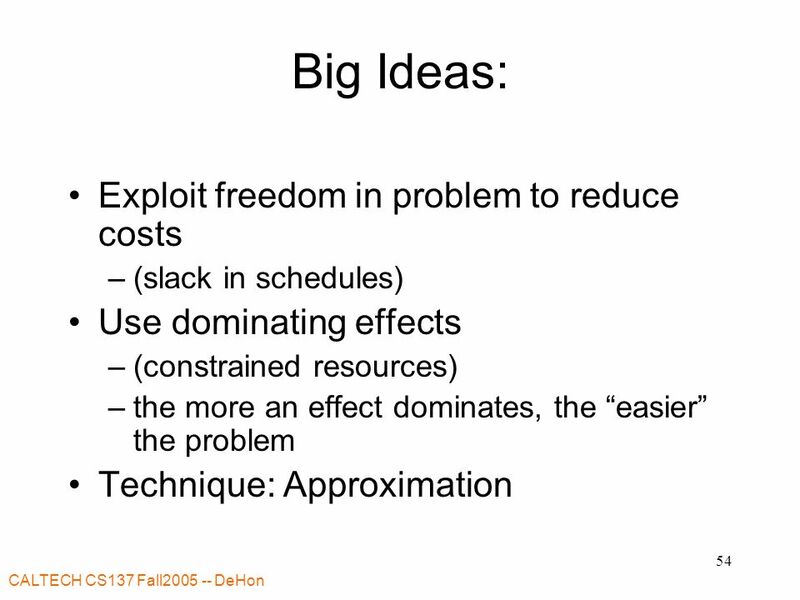 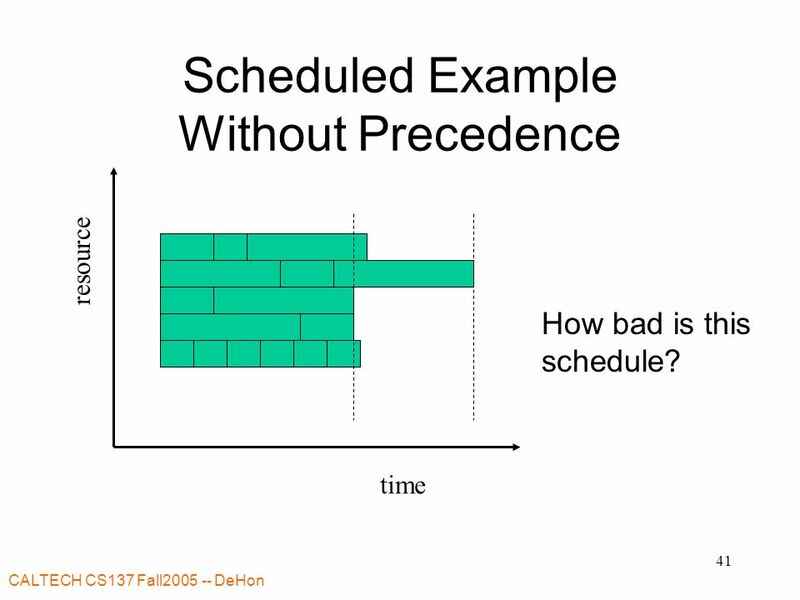 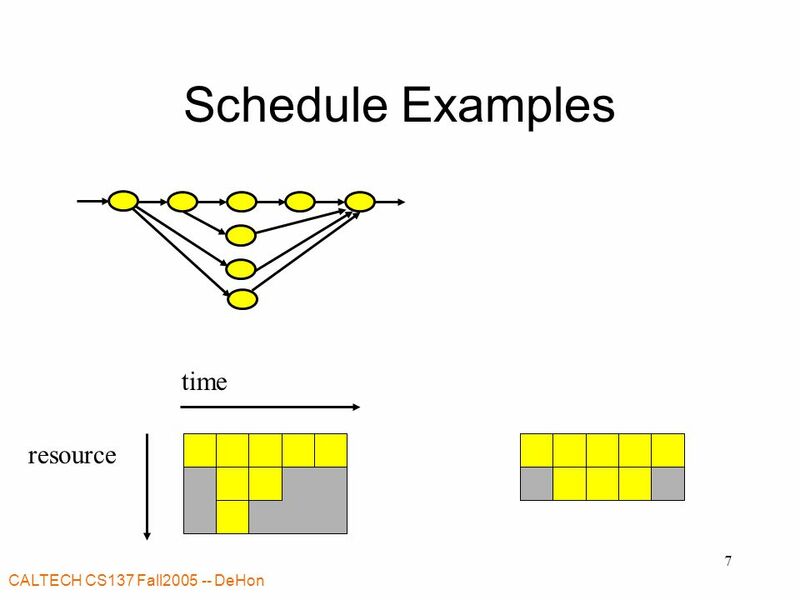 41 CALTECH CS137 Fall2005 -- DeHon 41 Scheduled Example Without Precedence time resource How bad is this schedule? 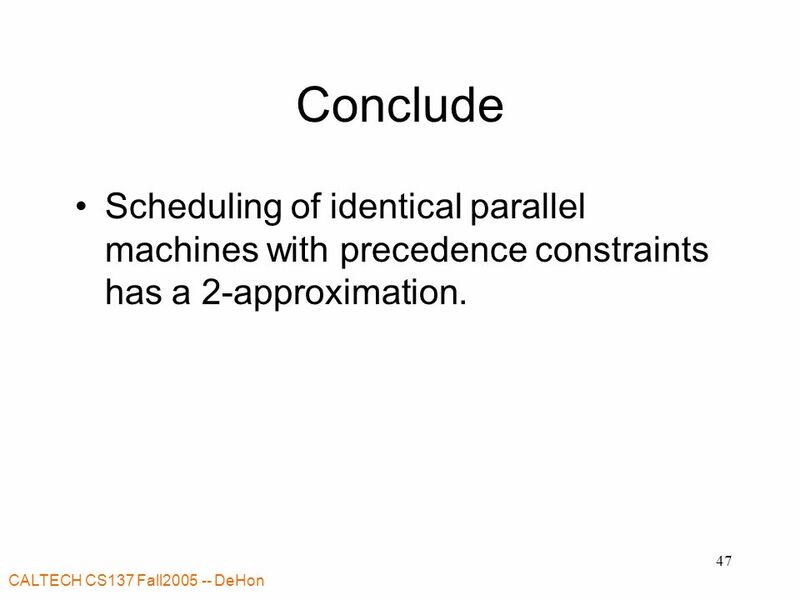 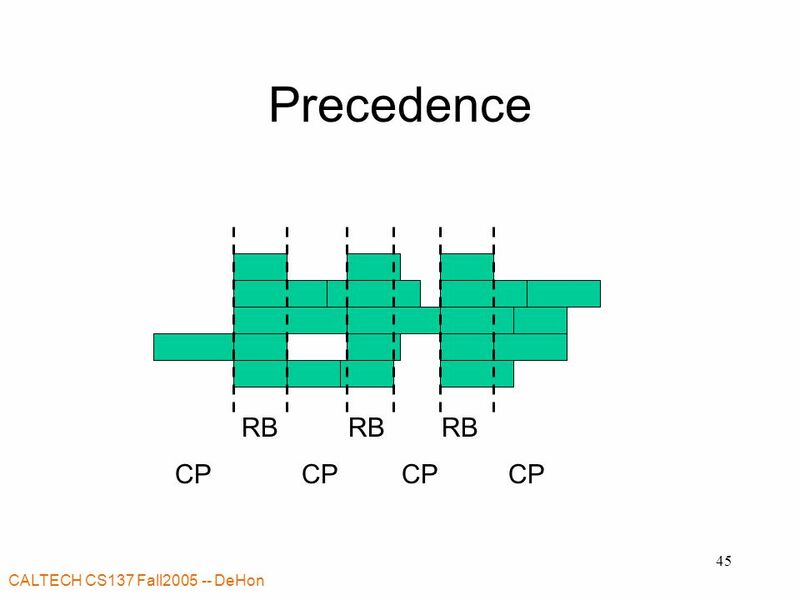 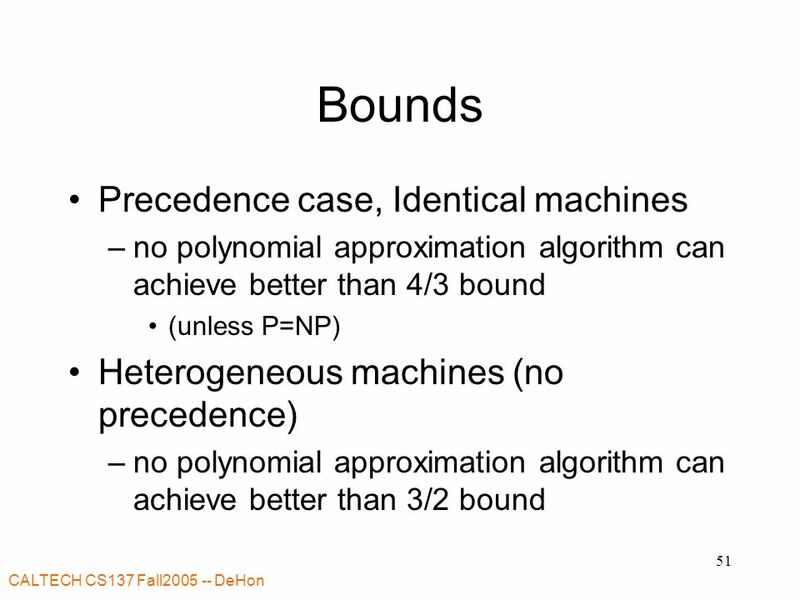 47 CALTECH CS137 Fall2005 -- DeHon 47 Conclude Scheduling of identical parallel machines with precedence constraints has a 2-approximation. 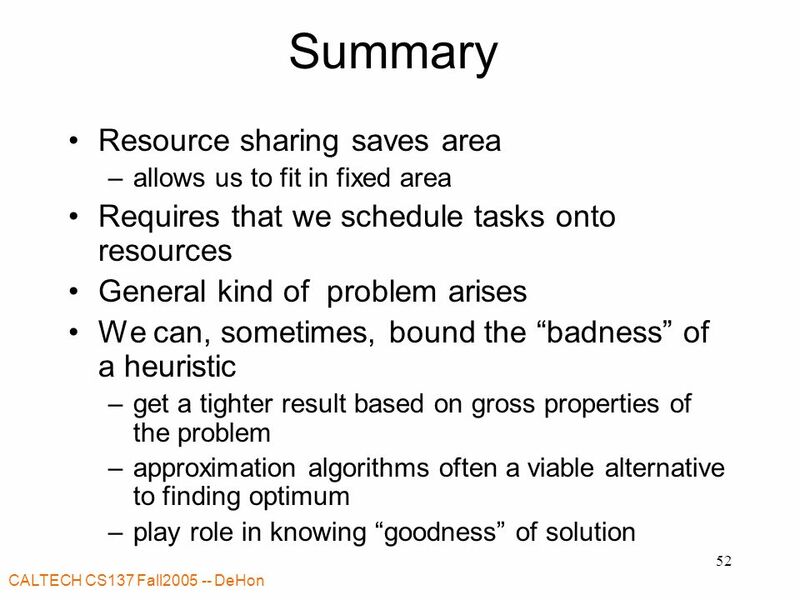 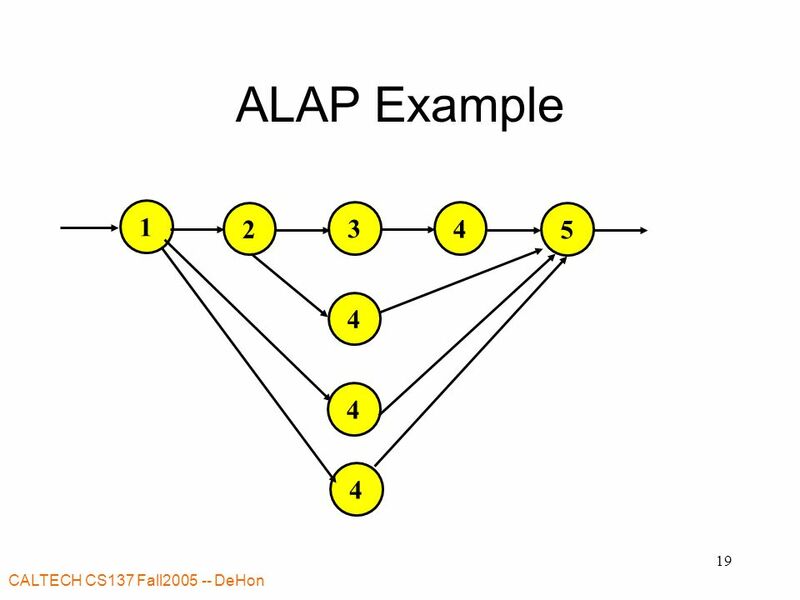 Download ppt "CALTECH CS137 Fall2005 -- DeHon 1 CS137: Electronic Design Automation Day 19: November 21, 2005 Scheduling Introduction." 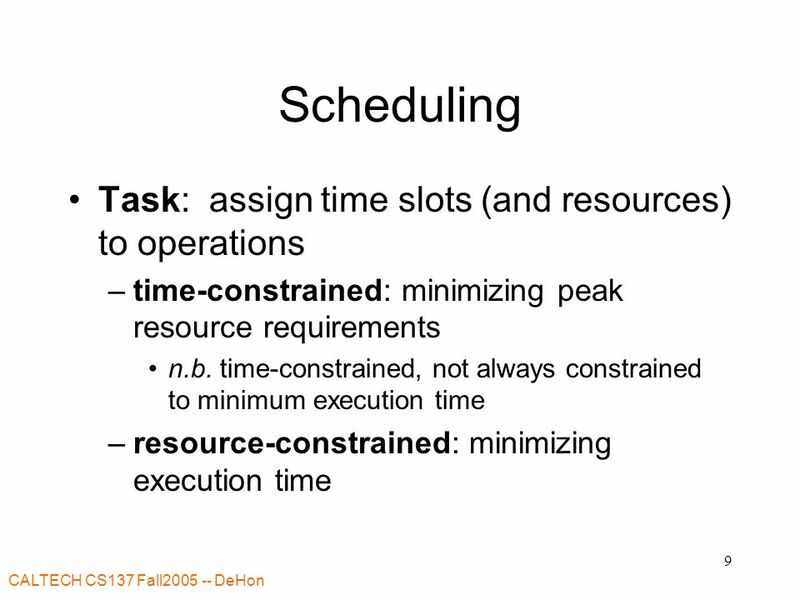 Energy-efficient Task Scheduling in Heterogeneous Environment 2013/10/25. 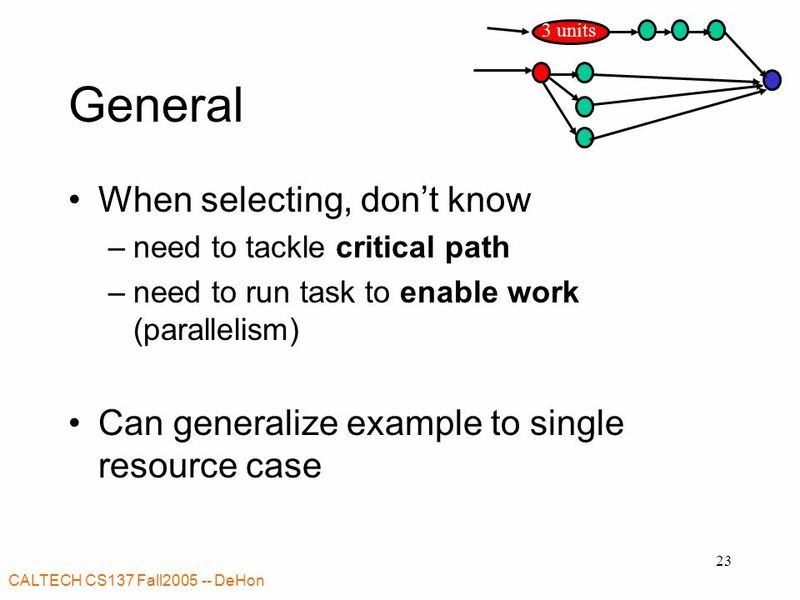 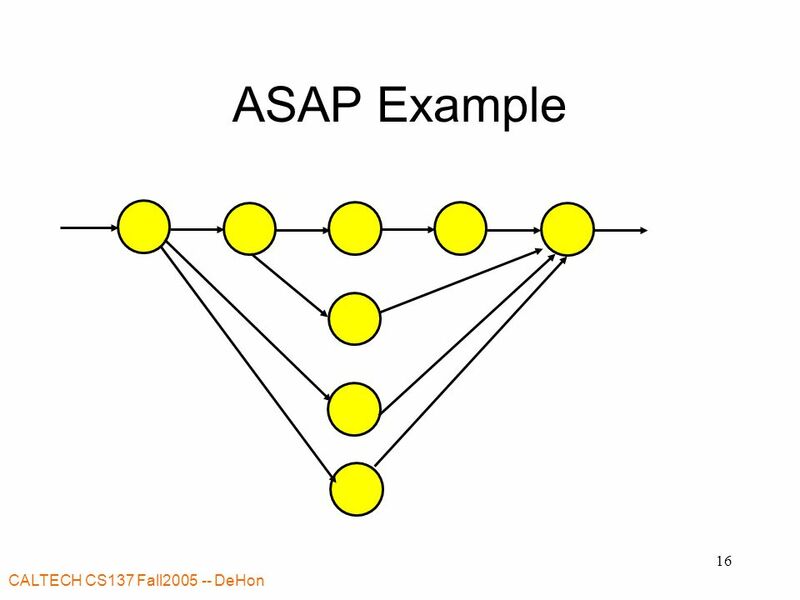 Load Balancing Parallel Applications on Heterogeneous Platforms. 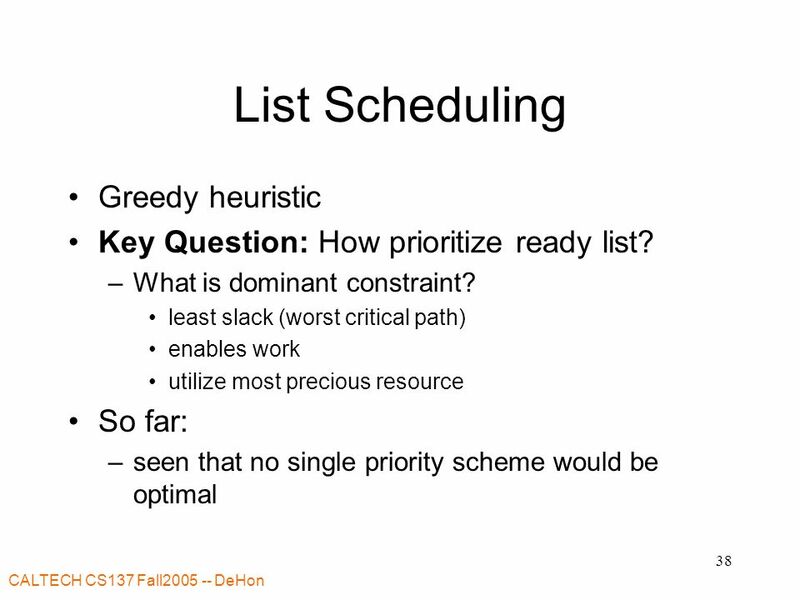 Scheduling in Distributed Systems Gurmeet Singh CS 599 Lecture. 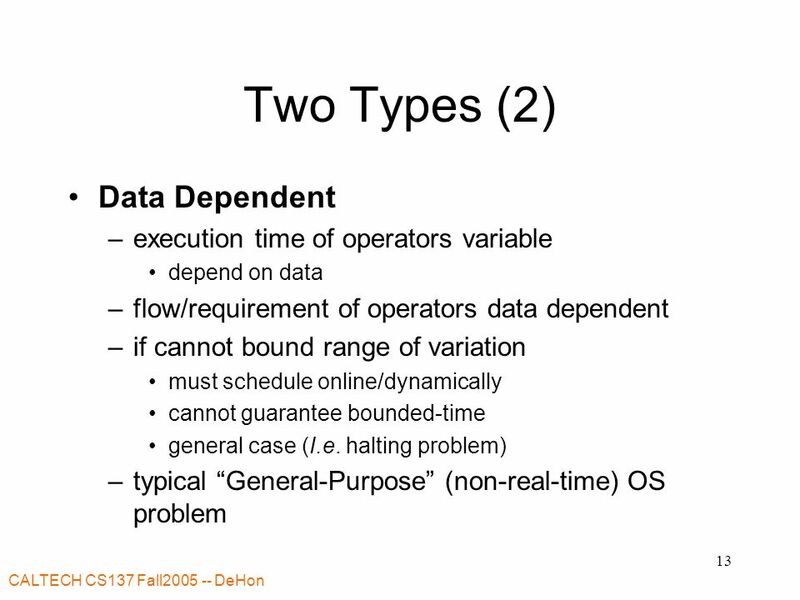 Architecture-dependent optimizations Functional units, delay slots and dependency analysis. 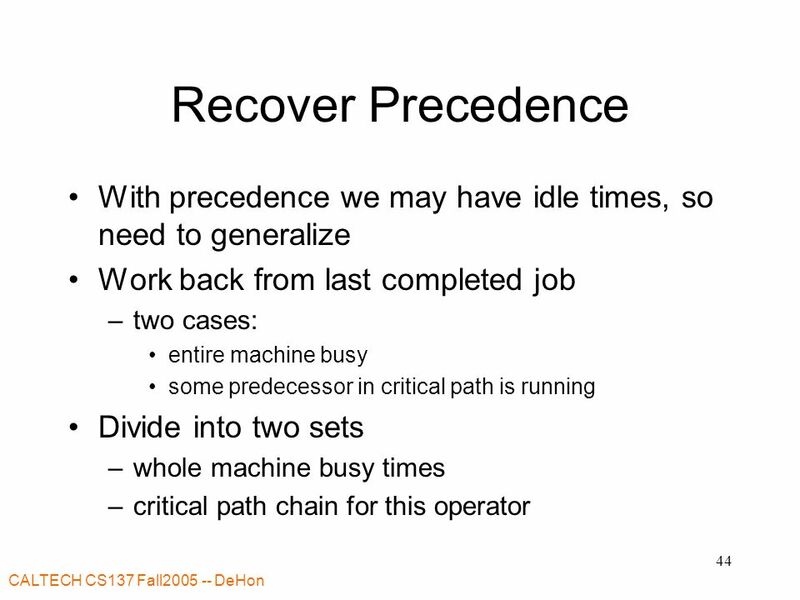 Evaluating Heuristics for the Fixed-Predecessor Subproblem of Pm | prec, p j = 1 | C max. 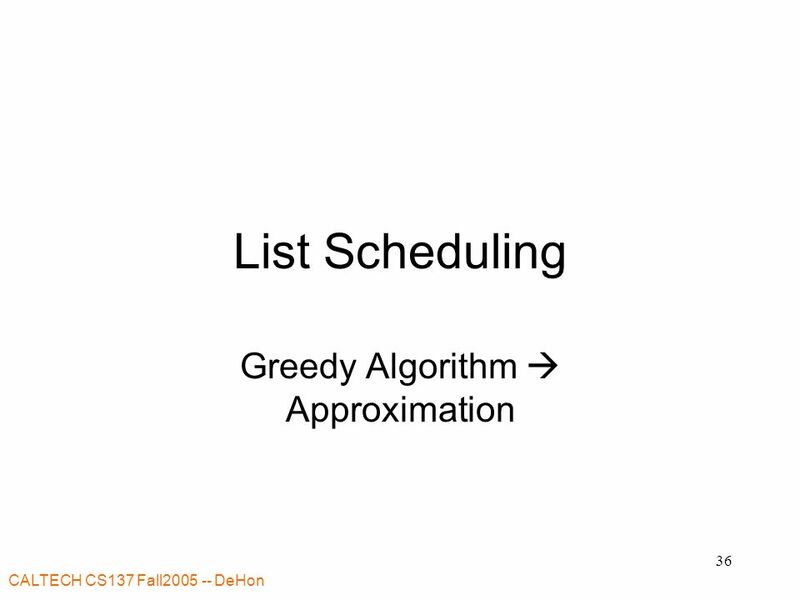 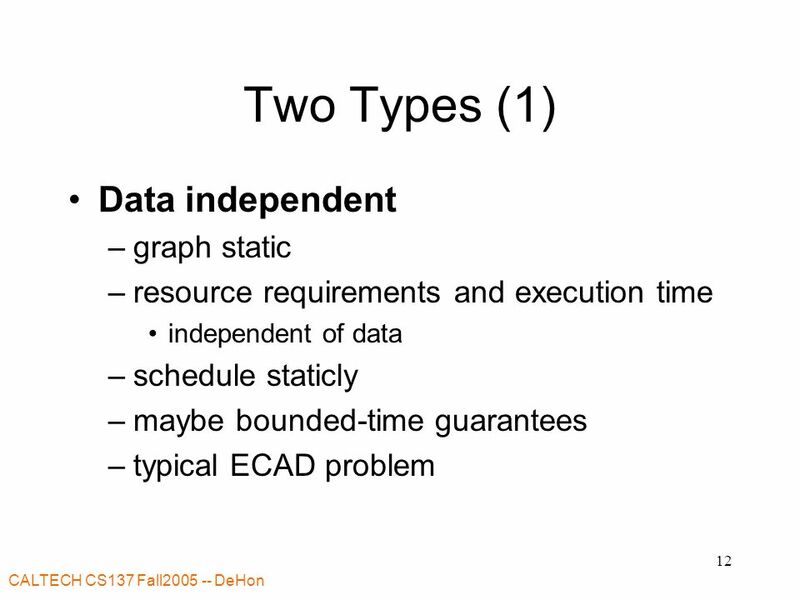 Penn ESE535 Spring DeHon 1 ESE535: Electronic Design Automation Day 8: February 11, 2015 Scheduling Introduction. 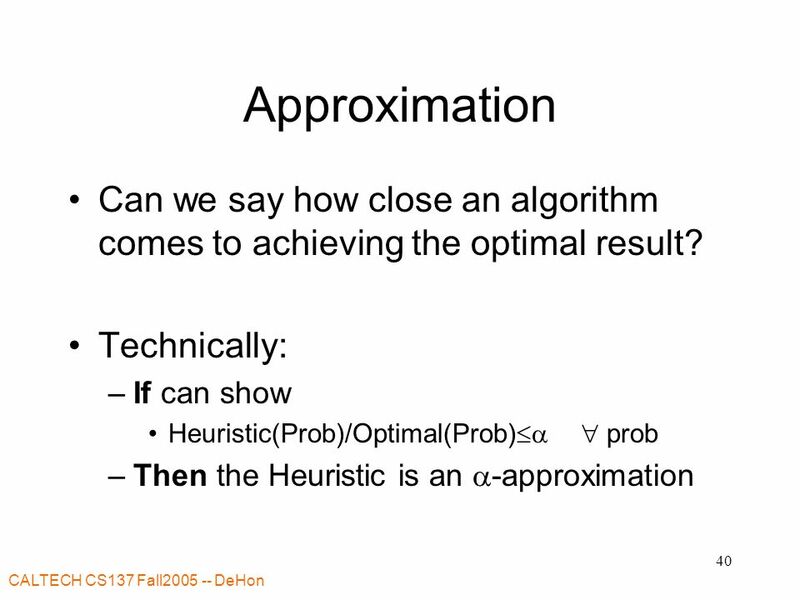 CALTECH CS137 Winter DeHon CS137: Electronic Design Automation Day 14: March 3, 2004 Scheduling Heuristics and Approximation. 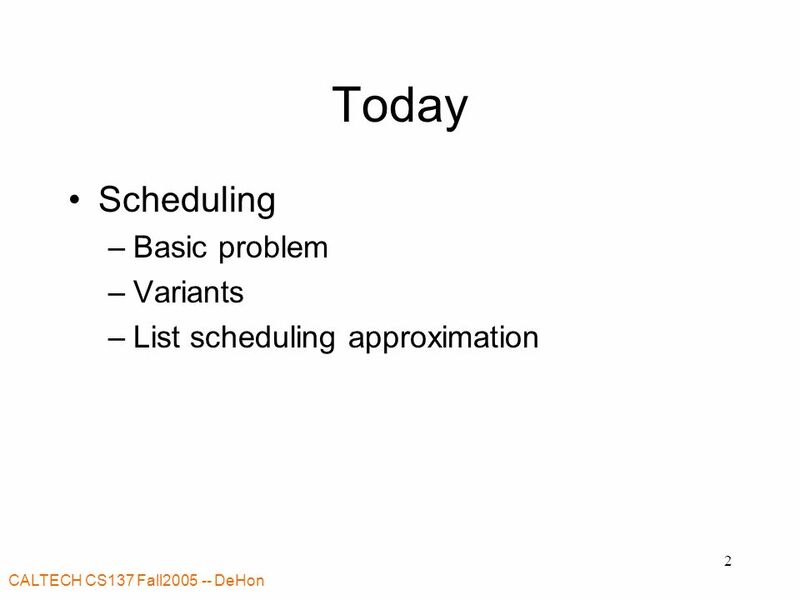 ISE480 Sequencing and Scheduling Izmir University of Economics ISE Fall Semestre. 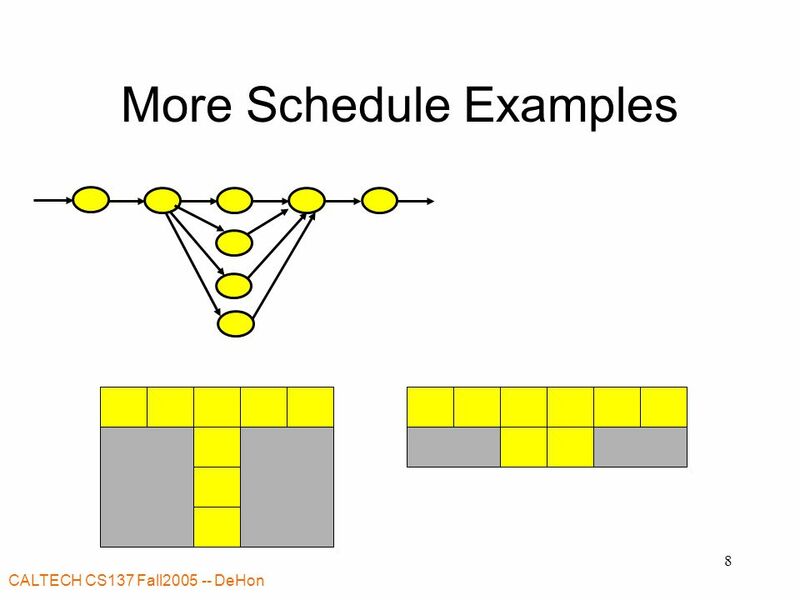 Introduction to Data Flow Graphs and their Scheduling Sources: Gang Quan. 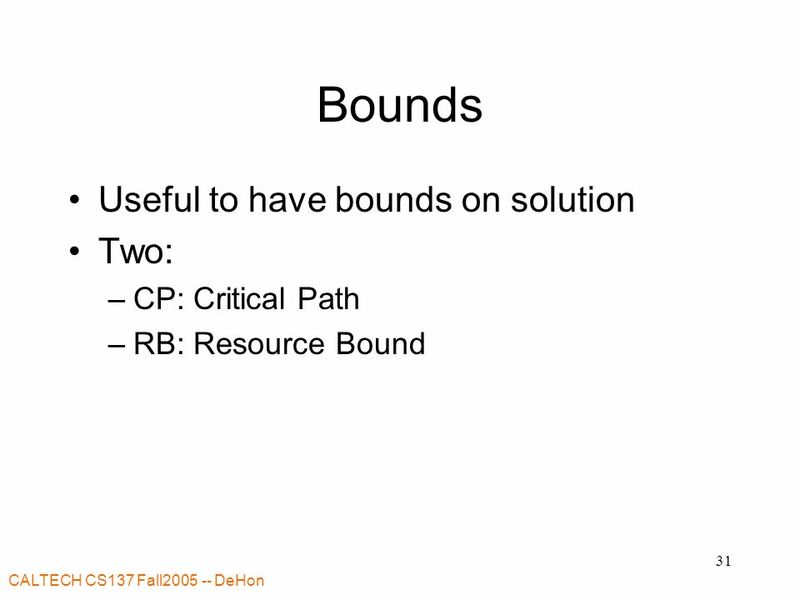 Winter 2005ICS 252-Intro to Computer Design ICS 252 Introduction to Computer Design Lecture 5-Scheudling Algorithms Winter 2005 Eli Bozorgzadeh Computer. 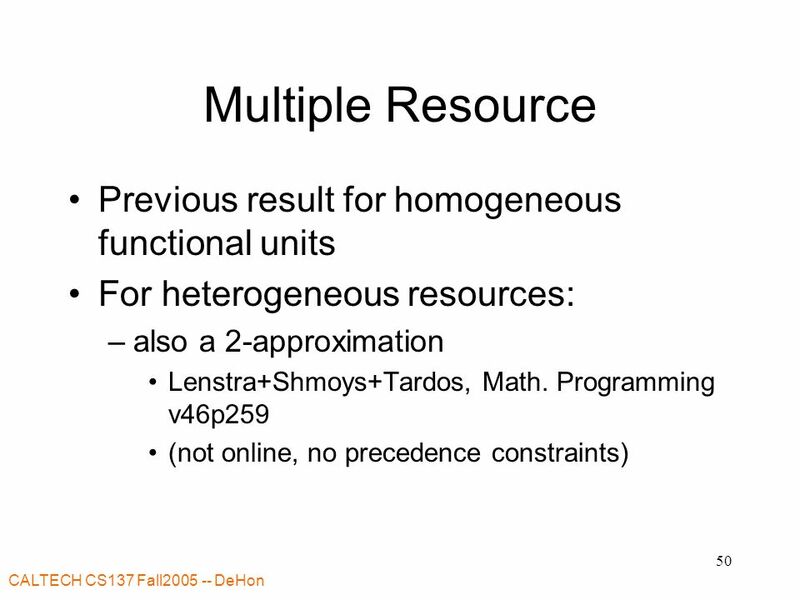 Reconfigurable Computing S. Reda, Brown University Reconfigurable Computing (EN2911X, Fall07) Lecture 10: RC Principles: Software (3/4) Prof. Sherief Reda. 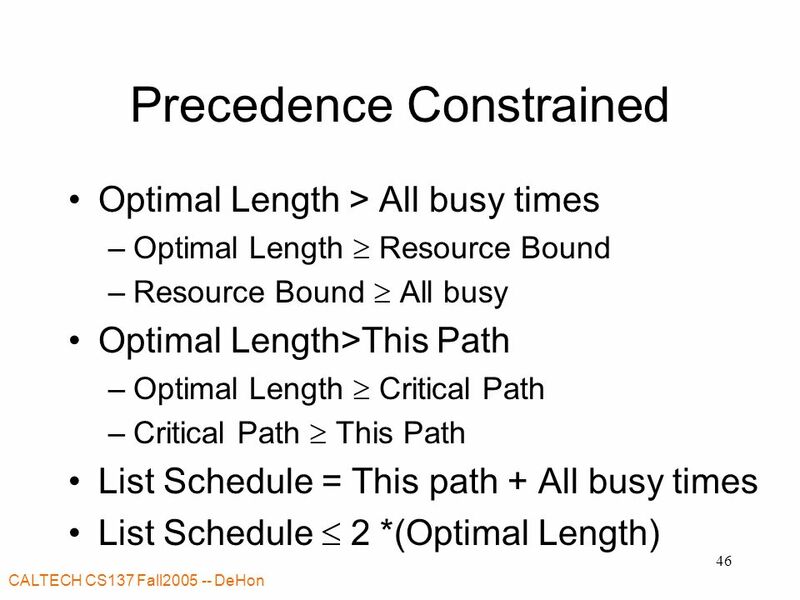 Precedence Constrained Scheduling Abhiram Ranade Dept. 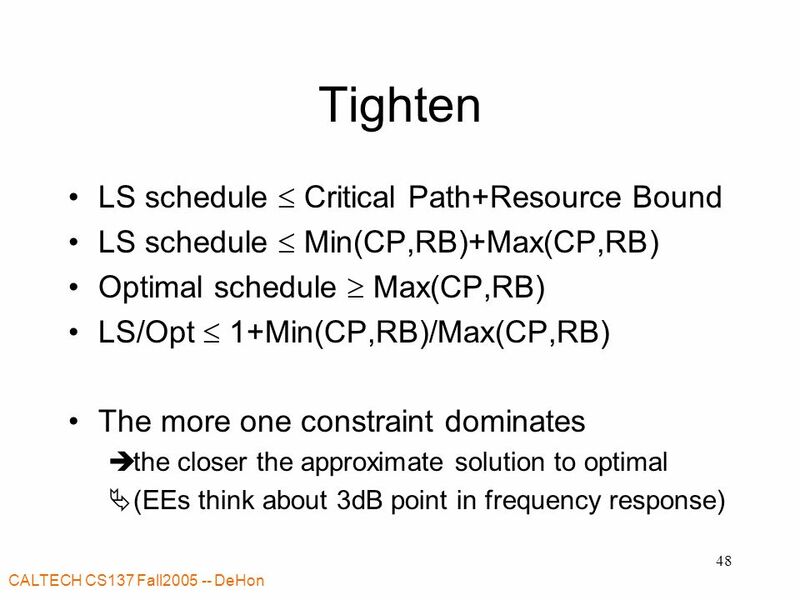 of CSE IIT Bombay. 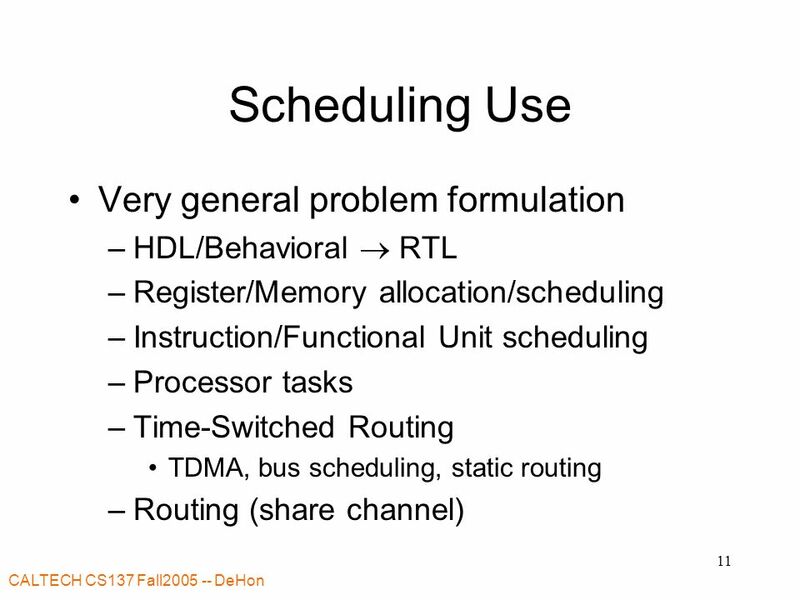 Caltech CS184a Fall DeHon1 CS184a: Computer Architecture (Structures and Organization) Day17: November 20, 2000 Time Multiplexing. 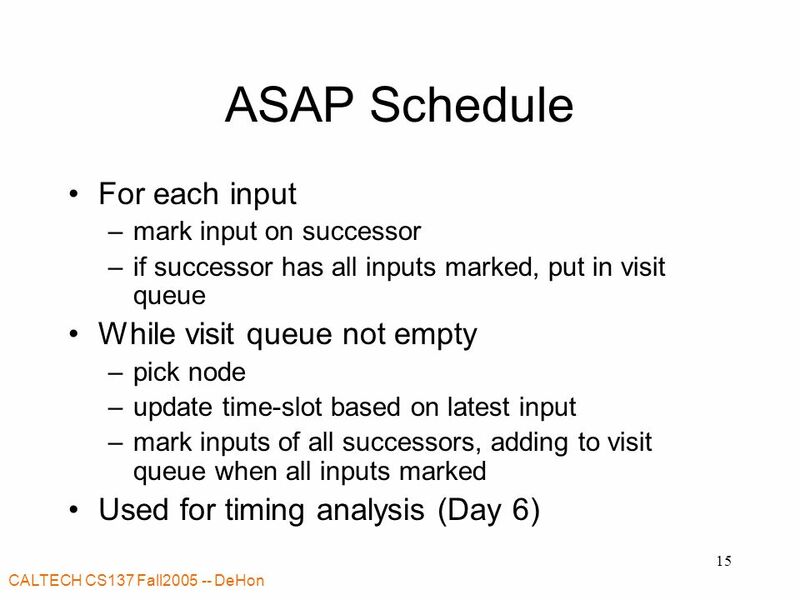 Penn ESE535 Spring DeHon 1 ESE535: Electronic Design Automation Day 17: April 2, 2008 Scheduling Introduction. 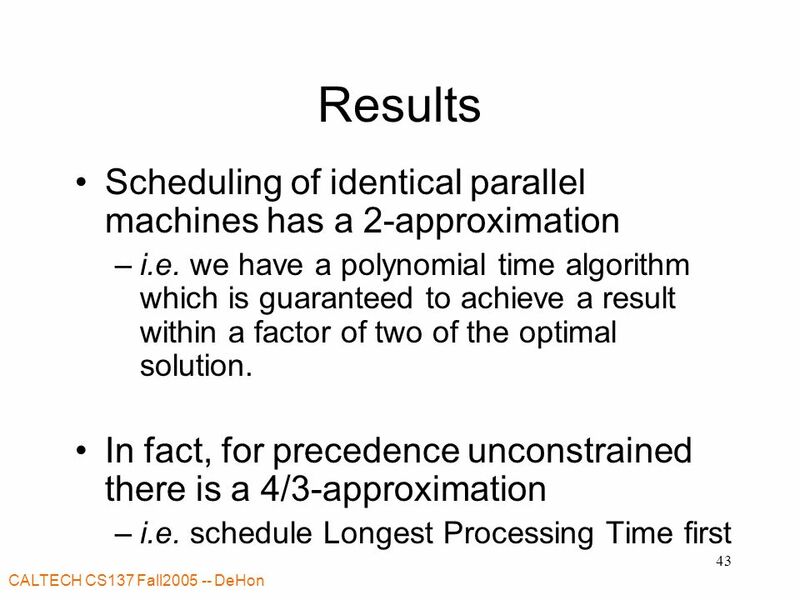 Penn ESE Spring DeHon 1 ESE (ESE534): Computer Organization Day 21: April 2, 2007 Time Multiplexing. 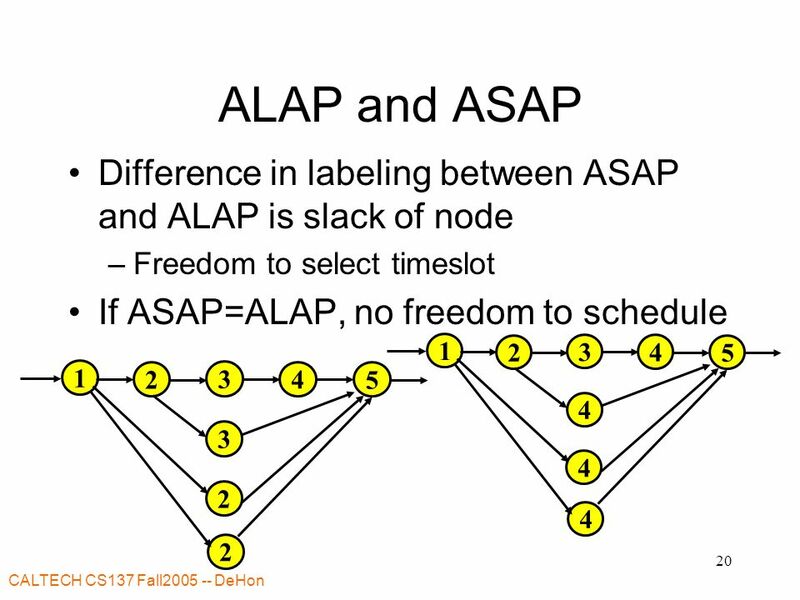 Penn ESE680-002 Spring2007 -- DeHon 1 ESE680-002 (ESE534): Computer Organization Day 21: April 2, 2007 Time Multiplexing.